Maybe the Arab Fall will be warmer than we thought. The Libyan revolt against the terrorists in their midst is a glorious tale of triumph and justice. There’s something about freedom and personal responsibility that inspire renewed conviction in the blood of Americana. We believe everybody should have the opportunity to govern their own destiny. Our natural resentment for those who prosper at the expense of good people pales only before our visceral disgust at those who squander the faith and hard-earned resources of their benefactors. For this reason, we wonder whether our billions in aid to hostile powers might be better spent elsewhere. It’s not that we disdain foreign aid, charity, or those in need. To the contrary, Americans are among the most charitable people on Earth. Rather, we are outraged by the wanton irresponsibility that manifests in criminal incompetence, and we abhor the murderous ingratitude that ensures the wages of kindness in the Near East are death. Ambassador Stevens and his aides were brave servants and excellent diplomats. They did not deserve so early and violent a rendezvous with Azrael. And for this reason, we wince at statements by our leaders that appear, rightly or wrongly, to apologize for our values. There is certainly a need for better understanding between the West and the Arab world. But how is it that we lose cherished public servants to a mob they helped liberate and yet feel compelled to reaffirm what should be our obvious commitment to religious tolerance for everyone? How is it that, just a week ago, we were bracing for fresh rounds of anti-American animus across the Muslim world? But in light of the storming of the Ansar al-Sharia Brigade and other militia headquarters in Benghazi, the world appears to be changing. And it is a strange, new world indeed when a Muslim crowd in North Africa unilaterally deposes Islamist networks to avenge murdered Americans. But as we cautiously celebrate these exciting developments, the militias are predictably crying foul. What they will do next is unclear. Going forward, our foreign policy should encourage greater comity with the Arab street while pressuring new governments and would-be allies in Libya and elsewhere to defend the rights of their citizens and safeguard the security of their guests. The tepid repudiation of violence by Egypt’s new president is a start. But our next president must make clear that how our “friends” define their “allies” will determine how we define ours. They are as perfectly free to ignore our concerns as they are to forego our support. At this critical juncture, our leaders must promote human rights as essential to both American interests and the vital project of democracy. Our focus should never shift from eliminating the obdurate evils of violence and repression that reek of innocent blood. J. Christopher Stevens and his fellow diplomats died in the service of freedom. The Libyan people have moved to honor that legacy. But we all have battles to fight and promises to keep—and miles to go before we sleep. 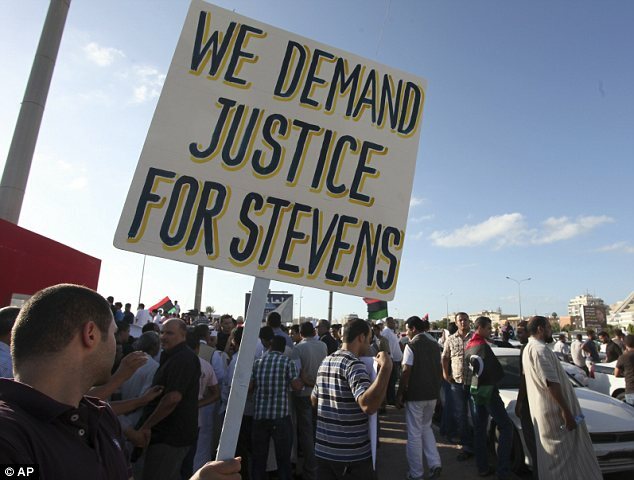 Categories: Uncategorized | Tags: Ambassador Chris Stevens, Arab Street, Benghazi, Egypt, free speech, human rights, Islamism, Libya, Middle East, Mohamed Morsi, terrorism | Permalink.